The "IT Boxing Championship" initiative is a series of events organized by the Bulgarian Association of Software Developers (BASD) at which we invite supporters of different software technologies to an open dispute "Which technology is better?". 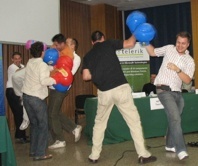 At these meetings the adherents of the opposing technologies defend their vision for better technology by presentations, discussions and open debate that ends up in direct fight with inflatable boxing gloves. The Java team won the third IT Boxing match: a battle between Enterprise and SOA platforms on 25 June 2008. The event was visited by 200 software engineers. The Java team presented a technical lecture about the Java EE platform as solution for enterprise and SOA applications and a live demonstration. The .NET team presented a technical lecture about Windows Communication Foundation (WCF) and Windows Workflow Foundation (WWF) and their power in building SOA applications. Our team is about the launch the next IT Boxing event: Platforms for Enterprise Development, Web Services and SOA. The event will be held on 25 June 2008 from 18:00 in Park Hotel Moscow in Sofia. The dispute will focus on the Web services and SOA solutions available in Java EE and Microsoft .NET platforms. 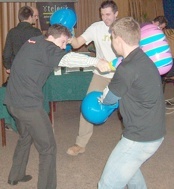 The Java team won the second IT Boxing match: a battle between Web technologies and frameworks on 6 March 2008. 24 speakers in 4 teams (.NET, Java, PHP and Ruby) fighted for showing which technolgy is better. Speakers presented 9 technical talks and an interesting dispute session. The event was attended by 350 software engineers but not all of them voted. The results are as follows: 75 votes for Java, 49 votes for .NET, 13 votes for Ruby and 11 votes for PHP. The second IT Boxing match will focus on the Web development technologies and frameworks in Java, .NET, PHP and other languages. It will be held on 6 March 2008 in Park-hotel Moscow, Sofia. On 11 December 2007 The .NET Team won the first IT Boxing match named “ADO.NET Entity Framework and LINQ vs. Java Persistence API and Hibernate”. The event was attended by more than 250 people! The .NET team presented LINQ to SQL as their primary ORM tool integrated in Visual Studio 2008. The Java team presented several ORM tools like Hibernate and JPA. Both teams fighted violently but the .NET team was better. Finally the vote of the audience stated 136 vs. 46 votes for .NET vs. Java (not all visitors voted). The subject of first event will be “.NET vs. Java database access technologies and ORM tools”. The .NET team will present ADO.NET Entity Framework and LINQ. The Java team will present Hibernate and Java Persistence API (JPA). The event will be held on 11 December (Tuesday), 18:00 h in Park Hotel “Moscow”, Sofia.